We’ve all heard the old pseudo-statistic that people are more afraid of public speaking than death. Although this might be hyperbole (would most people honestly rather die than speak in public? ), the point is that public speaking is something many people are afraid of and few excel at. But despite this, anyone can improve on this skill with some practice. Here are six strategies for effective public speaking. Advertisers have recognized for ages that people are inherently self-centered and have exhorted practitioners to perpetuate the “what’s in it for me,” or WIIFM, mentality—and your audience is the same. Audiences will be much more engaged with your presentation if you can convince them that it will benefit them somehow, so think about what’s in it for them, and open with those benefits. 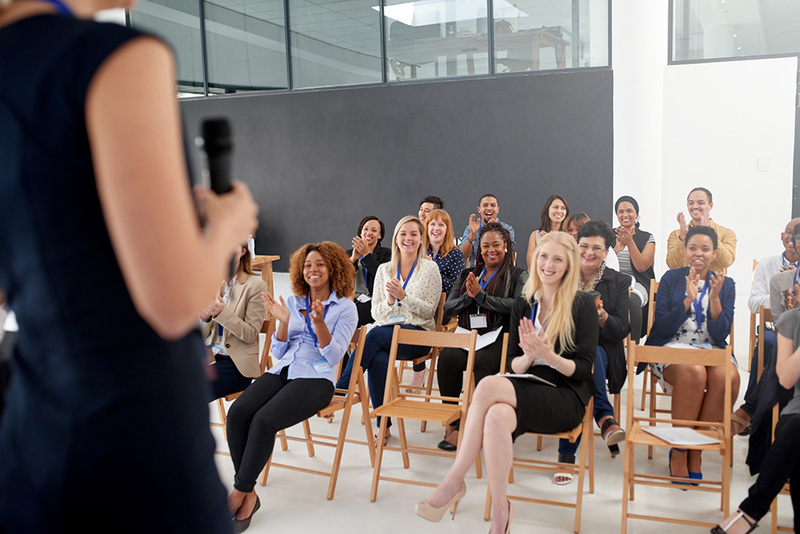 Part of the art of public speaking is being a good storyteller, so weaving in an anecdote that is relevant to the situation or sharing a challenge or conflict and explaining how it was overcome is a great way to engage an audience. Because people process sensory data differently—some are more visual, while others may be more hands-on or auditory—you should appeal to as many senses as you can. So, consider how you can bring your message to life by incorporating some or all of the five senses. Analogies and metaphors not only help people conceptualize the points you’re trying to make by relating them to something familiar but also keep an audience entertained. So think about how you can create analogies and metaphors to better engage your audience. Part of Public Speaking 101 is changing the tone, pitch, rhythm, and volume of your voice to avoid sounding monotonous and putting your audience to sleep. So, aim for variety in your speaking voice to maintain a better connection with your audience. Sharing something personal about yourself—especially something mildly self-deprecating—can put audiences at ease and help them relate to you. Remember that audiences love stories, and it’s even better when you share stories of your own experiences. Public speaking is terrifying for many, but improving one’s speaking ability is one of the best ways to build confidence and overcome that fear. And an added bonus is that being a strong public speaker is a great way to help advance one’s career in any organization.